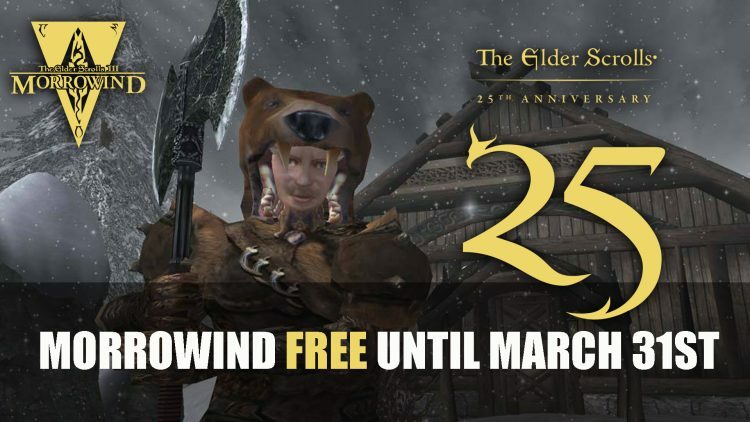 Bethesda are giving fans a chance to get Morrowind for free as they celebrate their 25th anniversary of The Elder Scrolls. From today until March 31st you can download The Elder Scrolls III: Morrowind Game of the Year Edition free of charge on PC. You will need to login or sign up for a Bethesda account and then redeem the code “TES25TH-MORROWIND” which will be added to your library. The Elder Scrolls 3: Morrowind is an open-world RPG set in the volcanic island of Vvardenfell, where players get to know the clans of Dunmer, a race of unique dark elves that only exist in Tamriel. This entry in the franchise challenged players with the treacherous and immortal Dagoth Ur in a battle for the kingdom. But that’s not all the festivities Bethesda has planned for their quarter of a century Elder Scrolls anniversary. There are promotions for The Elder Scrolls titles and add-ons as well as additional offers in-game. This also marks the start of The Elder Scrolls Online prologue quests for the upcoming expansion Elsweyr which launches this June. The Elder Scrolls 3: Morrowind is available for download for free until March 31st so grab it while you can! Check out the Bethesda website to claim. For more Elder Scrolls content be sure to check out Bethesda Confirms Attendance For E3 2019. You can also find out the upcoming updates for Bethesda’s Fallout 76 in Bethesda Reveal Fallout 76 Roadmap Of Free Content For 2019. If you’re looking for some MMO action be sure read the happenings in Elder Scrolls Online in Elder Scrolls Online Jester’s Festival Event Returns.